Hamilton brown strap watch featuring black chronograph dial set in stainless steel case and automatic movement. 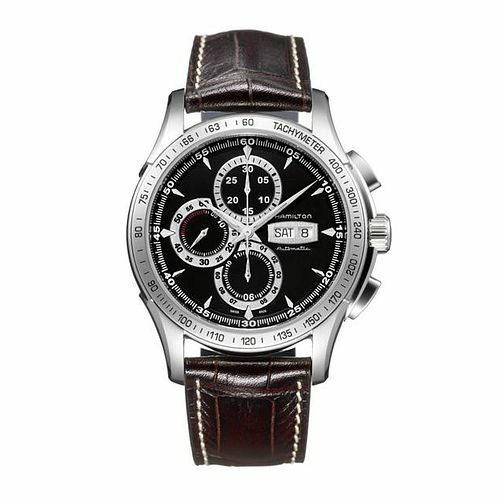 Hamilton men's brown strap chronograph watch is rated 3.0 out of 5 by 2. Rated 1 out of 5 by Anonymous from Nice watch shame it's not reliable. Had this watch for 6 months and it's jammed a couple of times. Now it has completely stopped working. Not impressed for the price. Will be returned to store for a credit note. Spent 3 months trying to find a nice watch as my previous Tag Heuer was stolen in a house burglary.I'll have to start looking again. Disappointed.